Dr. Craig Ellison treats patients suffering from car accident injury as well as injuries resulting from work- or sports-related incidents at Ellison Chiropractic. Dr. Ellison has been treating patients in the Eagle, Meridian, and Boise areas using wellness care and chiropractic methods such as the Activator Method ®, which requires a specialized instrument to adjust a patient and is gentler than standard manual adjustment methods. 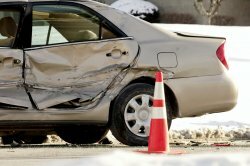 Whiplash, low back pain, and shoulder pain can all occur following a car accident. Our chiropractor, Dr. Ellison, offers advanced treatments for car accident injuries, including the Activator Method®. He also teaches patients corrective exercises to help them recover from injuries. The Activator Method® is an effective treatment for a car accident injury. The instrument allows our Meridian chiropractor to make an adjustment to your spine gently. Traditional manual adjustments require more force, which gives your body time to freeze or lock up, potentially reducing the effectiveness of the adjustment. Since using an instrument is both quick and gentle, treatment works better and lets you heal faster. In addition to the Activator Method®, Dr. Ellison also teaches patients suffering from accident injuries exercises to perform at home. These exercises work in tandem with spinal adjustments, making the adjustments even more effective. At-home exercises are also essential for wellness care following the healing process. Injuries have also been know to cause TMJ, which can be addressed through chiropractic, although some patients may elect to see their dentist depending on what specific issues may have arisen. Meridian chiropractor, Dr. Ellison, treats many injuries that occur on the job or when playing a sport. Carpal tunnel syndrome is a common personal injury that usually occurs at jobs that require a lot of repetitive movements, such as typing, kneading bread as a baker, or working on an assembly line. Signs of carpal tunnel syndrome include a tingling feeling in the hand and wrist areas as well as weakness in those areas. Treatment for carpal tunnel includes an adjustment in the wrist area as well as spinal adjustments. Wrist exercises and stretches are essential for wellness care and to re-build strength in the hands. Lifting heavy objects on the job or straining when exercising or playing a sport can injure the back, causing lower or upper back pain. Whiplash can happen after a rough tackle on the football field. Other common sports injuries that can be treated with chiropractic care include tennis elbow, plantar fasciitis, or heel pain. Despite its name, tennis elbow is common in plumbers, musicians, and office workers. Adjustments treat injuries to many parts of the body, not just the back and neck. Many patients at our clinic also benefit from stretching the injured area and performing exercises to help strengthen and restore the area as well. Once you have recovered from a car accident, work or sports-related injury, it is important to continue to schedule appointments at our clinic in the Eagle, Meridian and Boise area for continued pain relief and follow-up wellness care.